Early in Desert Body Creep, amid scattered clumps of fabric recalling road-kill, Angela Goh enacts her own abduction. Tumbling feet over head in a spotlight beam, she stares up and out at some sight unseen. The synthetic guitar twang of the soundtrack together with Goh’s grungy tracksuit pants and sneakers give the moment the strung-out feel of so many backwater x-file narratives. The piece’s title goes some way to evoking this half-way-to-nowhere landscape, where mundanity merges with the otherworldly. This is a land forsaken, where life slithers through the cracks, coiling and recoiling beneath the almost-too-bright light. In this harsh environment Goh performs her becoming and eventual unbecoming. Connecting an almost metre-long, giant gummi worm to the base of her neck, and animating it with the movement of her spine as she crawls on hands and knees towards the audience, Goh submits to a world in which the dead and un-dead are playfully symbiotic. The worm is, from this moment of invasion, Goh’s mode of conceptual excavation, embodied or reflected in each new episode. The dancer is able to conjure its presence physically and, in a striking sequence, aurally. Sitting before a sampler, microphone in hand, she multi-tracks herself singing wordless harmonies. The sounds are extracted like vermicular parasites from Goh’s gaping mouth. Harmonies breed and loop to form a cacophonous other, the cycle rendering the voice abject, no longer a voice but a creature in its own right, stretching and writhing the length of the space. As in any dreamscape, one thing is always in a state of becoming another. Shadows climb the walls, human screams emerge from the indistinct mass of noise. Goh, open-mouthed and sliding prone, ‘consumes’ the strewn fabrics, only then to rise and hunch beneath them—zombie-like, road-kill reanimated. Abduction, possession, reanimation—it’s the stuff of midnight movie specials, and apt, given that the piece is, in many ways, a horror story. Yet it’s never quite clear what, or who, is the monster, as every object, no matter how seemingly benign, is made monstrous, only to be consumed, or contained, so that the audience comes instead to be haunted by a cool and unflinching emptiness. The audience’s fear then, is drawn not from things being given life, from spent objects rising from the dead or the dancer transmogrifying behind ever more hideous guises. The fear is that there will come a point, maybe inside this very room, when there is nothing left to consume or transform. The fear is not of an insatiable hunger, but of infinite reprisal without chaos, art-making without desire or fear. As the performance draws towards its conclusion, Goh becomes the worm, only to emerge naked from its signifier, a velour cocoon. In an act of domesticity no less horrifying, she stuffs her cast-off skin and its contents into a zip-lock bag and uses a vacuum cleaner to render the package airless and without excess. This action is accompanied only by the faint vacuum scream, the sound of empty space being torn from one place to fill another. Here the piece loses its momentum, gaining clarity to its detriment. For in this moment, Angela Goh seemingly unintentionally becomes the model post- post- artist, turning nothing into nothing to say something about nothing in a way that fails to give the exchange the silhouette of something more sinister. She then stands on a vibrating exercise platform, the kind that a tracksuit-wearing UFO enthusiast from the suburbs might use to tone her glutes. 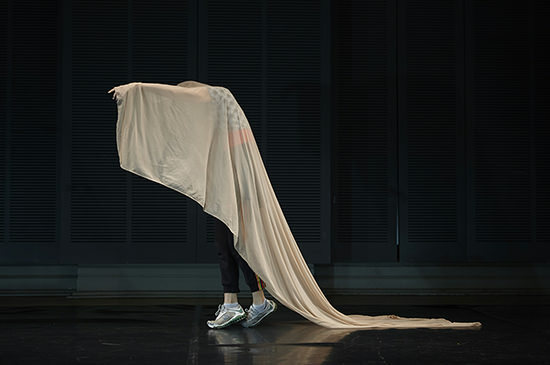 With her back to the audience, Goh allows the machine to shake loose the last vestiges of herself as concrete, the image of her rippling skin rendering her core-less. The artist is incomplete, empty, and she is free. As the lights dim, she sits at an upright piano at the side of the stage, and plays a tune. It’s almost familiar, leaving the audience to make contact with the piece from a place they’ve since left behind.